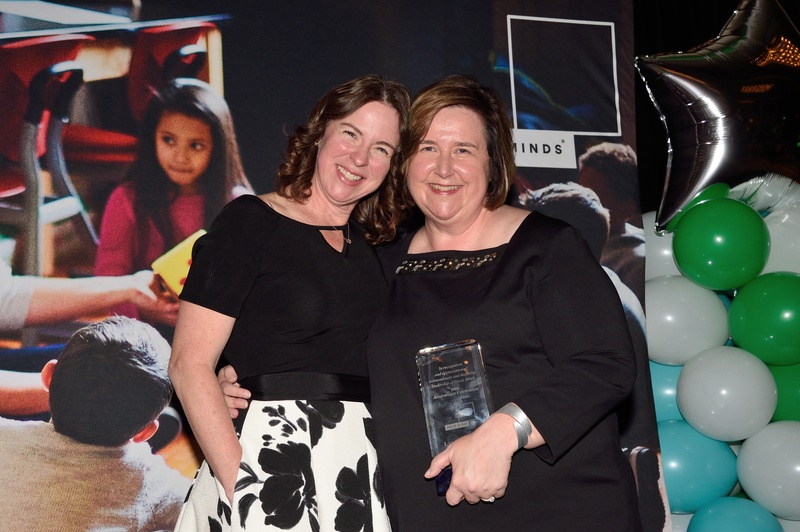 Great Minds, the organization behind Eureka Math/EngageNY Math and Wit & Wisdom, celebrated ten years of bringing quality, knowledge-rich curricula to American classrooms with the Great Minds team, education thought leaders, and teachers from around the country. 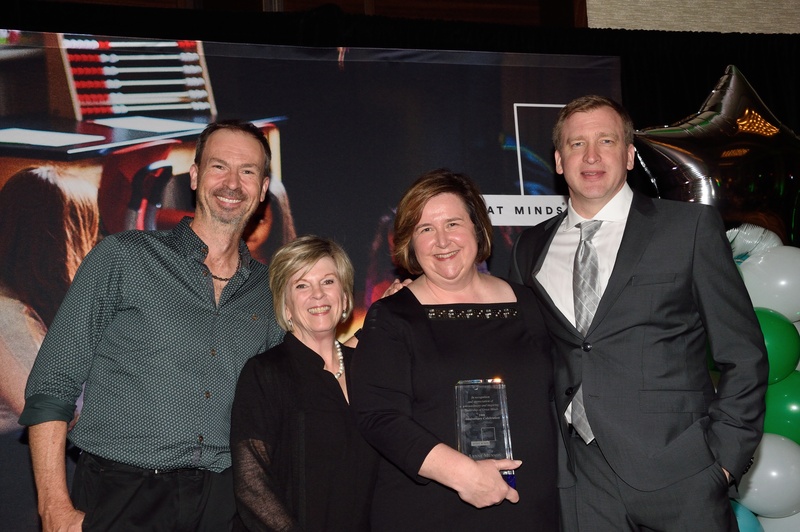 Below are the remarks made by Great Minds Founder & CEO Lynne Munson at the 10-Year Celebration. This is an evening of thanks and of celebration—not only because this year’s annual conference of the National Council of Teachers of Mathematics is in Great Minds’ hometown but also because Great Minds® just turned 10 years old. I don’t know what amazes me more: That we’ve grown from two employees in borrowed office space just a few blocks from here, to more than 250 employees nationwide; or that our uncompromising Eureka Math™ curriculum is now the most widely used core curriculum in any subject, ever. And I understand why people are confused. Because we are different. We have little in common with almost anyone else who creates core curriculum. In fact, we do almost everything differently than do others in our space—starting not just with how we make curriculum, but even why we make it. The best way to know us is to understand how we came to do what we do. Let me explain. Great Minds started as a group of educators from every rank in the profession and every part of the country. Ten years ago, we came together because we were unhappy with the instructional materials in our classrooms, schools, districts, and homes. The market was dominated by scripted, procedural materials that drove expectations down. So, we took matters in to our own hands and started writing and sharing curriculum based on what research told us works and what we saw was working in classrooms. These materials celebrate knowledge, respect the craft of teaching, and acknowledge the true capabilities of students. In 2010, we released K–12 Common Core–based curriculum maps in English language arts. The classroom teachers who wrote those maps did it because they were aching to share what their years of experience had taught them: That children relish knowledge and that beautifully written and illustrated books are the best means for teaching every ELA skill—writing, discourse, vocabulary, spelling, grammar, you name it. When we released those materials, we had no idea whether anyone would care. A DC-based nonprofit with a free English curriculum online. No marketing, no salespeople, zero understanding of RFPs or RFIs or RFQs, and no clue about adoption processes. But darned if teachers didn’t find us. Because great teachers are always trying to find something better. And when they looked at what our teachers had to share, they reacted just as we had hoped. Requests for PD and print materials started coming in, and these things called purchase orders began coming through the fax. And before long, we found ourselves in the core curriculum business, a place dominated by well-known names and where few others dare go. Our first reaction was “You must be kidding.” But people kept asking about a math curriculum and telling us this was a real need. We listened. And we learned that what was holding back math education in America was similar to what was wrong in ELA: Nearly all the materials being used were shallow and procedural or incoherent or both. Skills were being taught independent of knowledge, which never works, no matter the subject. Worst of all, many materials attempted to script teachers rather than support their need—and desire—to better understand the mathematics they were expected to teach. So again we took matters into our own hands and drew up a plan to create a truly new math curriculum. One that was intelligently designed to teach math as a coherent body of knowledge and not just a set of skills. A curriculum that would instill deep, conceptual understanding that students could build on as high as they wanted to. We submitted those plans to the New York State Education Department and won the contracts to create every grade of what is known as the EngageNY Math curriculum. We call it Eureka Math. The Eureka Math project is no less than historic, not just in the history of education but, I’m convinced, in the American story. Because once millions of math-enabled graduates are released into our society, I believe we will see capability and creativity we’ve not yet seen in our lifetimes. So at the age of 10, if Great Minds was a student she would be in fourth grade. As the mother of a third grader and a fifth grader, let me tell you that puts things in perspective. We are still very young and are indeed about as humble as a fourth grader. 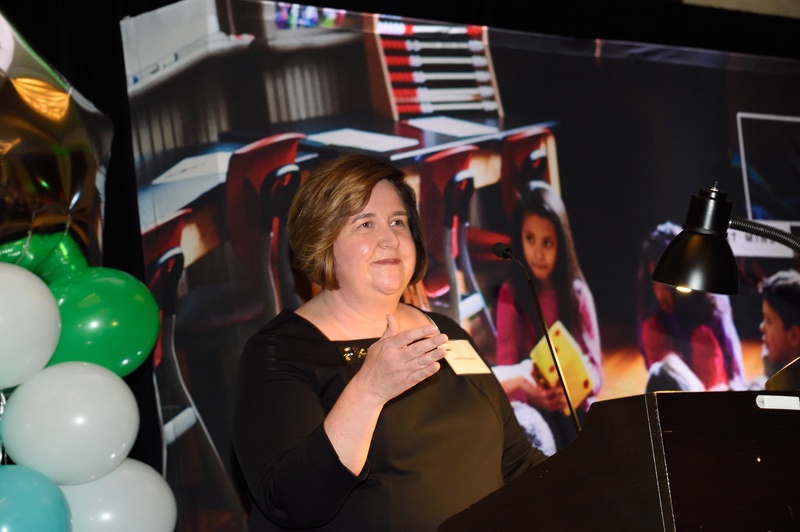 We have big plans for our future that are centered on a single goal: To provide teachers, for every subject in the K–12 curriculum, materials that are worthy of their practice, their intelligence, their potential. Last year, we released Wit & Wisdom®, a comprehensive K–8 ELA curriculum that springs directly from our original curriculum maps in ELA. Wit & Wisdom is the most highly praised ELA curriculum available today, sharing with Eureka Math near perfect scores and all green lights from EdReports.org, exemplar status from Achieve’s EQuIP, and a Tier 1 ranking from the Louisiana Department of Education. Districts in 23 states have already adopted it. Yes—Wit & Wisdom is the Eureka Math of ELA. We have also created a series of “decodable” books for the youngest readers. Aligned with the knowledge in Wit & Wisdom and with the scope and sequence of the most widely used reading foundations program, these small books truly build knowledge as students practice phonics. We call them Geodes because the knowledge contained in these slim volumes is such a marvelous surprise. And by the end of this year, we will have a few grades of our next comprehensive core curriculum ready to share. Based on the Next Generation Science Standards and inspired by the limitless potential of science, PhD Science™ will bring high expectations into classrooms with the same joyful rigor you know from Eureka Math. PhD Science has been piloted in schools in California, Illinois, Louisiana, Tennessee, and more. Teachers tell us that fourth graders are voting to stay in from recess so they can see how their experiments turn out. Look for grades 3–5 soon and grades 6–8 after that. No matter how large we grow at Great Minds, the most essential things about us will remain the same. We will always believe in the importance of setting high expectations for ourselves, for our peers in the classroom, and for all students—all students. Everything we craft will always assume that greatness is the goal. We will always believe in teachers and in the central, irreplaceable role they play in the classroom. Empowering teachers will always be our goal. Finally, we will always believe in the vital role that education plays in our democracy. Giving young people the knowledge and the abilities that allow them to pursue the future of their choosing is, in many ways, a teacher’s definition of freedom. It is certainly ours at Great Minds. Thank you for coming tonight and for helping us celebrate our first decade of work together. I promise you, this is merely the beginning. 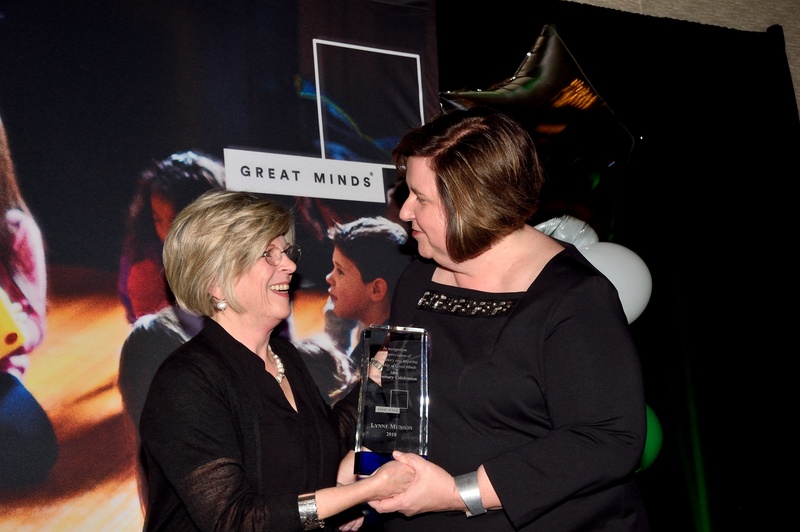 Chairman of Great Minds' Board, Nell McAnelly, presenting Lynne Munson with an award for her dedication and leadership. From left: Dr. James Tanton; Chairman Nell McAnelly; Great Minds Founder & CEO Lynne Munson; Lead writer of the Common Core State Standards for Mathematics, Dr. Jason Zimba. Great Minds Director of Mathematics Jill Diniz with Founder & CEO Lynne Munson.